Because no one likes doing the same job twice. Traditional VPNs were built for reliable, static connections between two devices—not the highly dynamic and unpredictable connections experienced by mobile workers. Mobile workforces require a purpose-built solution, like NetMotion Mobility, to manage connections and stay productive across unpredictable networks. 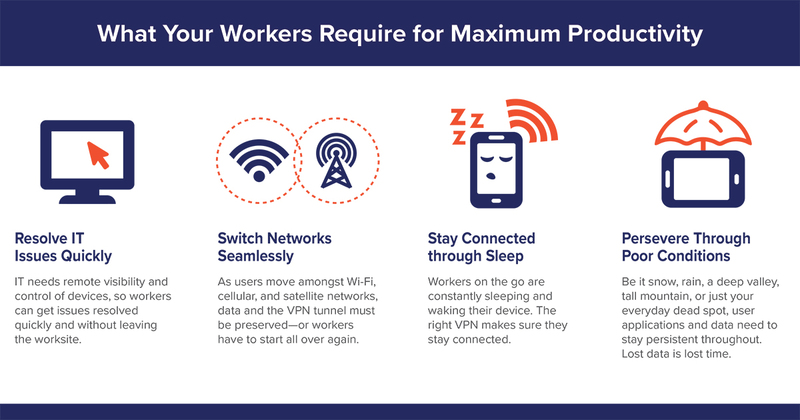 This infographic includes three reasons why traditional VPN technologies fall short and the three reasons why a purpose-built VPN is a better option for mobile workers. Download a copy of the Why Mobile Workforces Require a Purpose-Built VPN infographic to understand why the right tool for the right job is so important.